Waite commented: "Like others of his school, Fludd insists on the uncertainty of a posteriori and experimental methods, to which he unhesitatingly attributes all the errors of the natural sciences..."
But absolutely nothing remains of that one and only medicament of which Hippocrates makes mention (darkly and mystically, I admit) in several places, and still less are its operations understood, inasmuch as no one now searches with lynx-like eyes into the profound depths of true natural philosophy, to gain an accurate knowledge of its composition and its virtues. According to Waite: "In Medicine he laments the loss of that universal panacea referred to by Hippocrates." Which of us has, at this day, the ability to discover those true and vivific numbers whereby the elements are united and bound to one another? The art, also, of alchemy or chemistry is surrounded with such insoluble enigmas that we can scarcely gain anything but ignorance therefrom, and ignotum per ignotius. At the beginning of the 17th century many learned heads in England were occupied with Theosophy, Cabbalism, and Alchemy: amongst the proofs of this... may be cited the works of John Pordage, of Norbert, of Thomas and Samuel Norton, but above all (in reference to our present inquiry) of Robert Fludd. Fludd it was, or whosoever was the author of the Summum Bonum 1629, that must be considered as the immediate father of Freemasonry, as Andrea was its remote father. What was the particular occasion of his own first acquaintance with Rosicrucianism, is not recorded: all the books of Alchemy or other occult knowledge, published in Germany, were at that time immediately carried over to England — provided they were written in Latin; and, if written in German, were soon translated for the benefit of English students. He may therefore have gained his knowledge immediately from the three Rosicrucian books. But it is more probable that he acquired his knowledge on this head from his friend Maier (mentioned in the preceding chapter) who was intimate with Fludd during his stay in England, and corresponded with him after he left it. At all events he must have been initiated into Rosicrucianism at an early period, having published his apology for it in the year 1617. 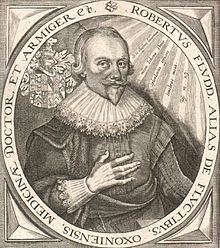 THE central figure of Rosicrucian literature, towering as an intellectual giant above the crowd of souffleurs, theosophists, and charlatanic professors of the magnum opus, who, directly or otherwise, were connected with the mysterious Brotherhood, is Robertus de Fluctibus, the great English mystical philosopher of the seventeenth century, a man of immense erudition, of exalted mind, and, to judge by his writings, of extreme personal sanctity. Ennemoser describes him as one of the most distinguished disciples of Paracelsus, but refuses to number him with "those consecrated theosophists who draw all wisdom from the fountain of eternal light." He does not state his reasons for this depreciatory judgment, and the brief and inadequate notice which he gives of Fludd's system displays such a cursory acquaintance with the works in which it is developed, that it is doubtful whether he had taken pains to understand his author. Fludd's apology for the Brotherhood of the Rosy Cross was first issued in 1616, being printed in Leyden. It "entitles him to be regarded as the high priest of their mysteries." It is said that Maier visited Fludd in London in 1615, and the result of his visit was, we know, the publication of his 'Apologia,' written in Latin, and published in Leyden in 1616. This page was last edited on 19 September 2018, at 21:30.